While no specific dollar amounts for West Lincoln Memorial Hospital’s rebuild announced in today’s provincial budget, Niagara West MPP Sam Oosterhoff said the budget is still great news. “It’s fantastic news that the West Lincoln Memorial Hospital was included twice in the budget. That is a huge step forward,” said Oosterhoff from Queen’s Park, right after the speech was concluded. During his presentation, Minister of Finance Vic Fedeli did not mention WLMH specifically, but the facility is mentioned at two points in the printed edition. “Ontario’s Government for the People is supporting infrastructure investments that will ensure patients and their families have access to health care they need. 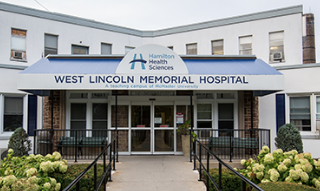 This is why the Province is supporting early planning for the redevelopment of the West Lincoln Memorial Hospital in West Niagara,” reads the budget. It also states that support will be “planning funding for construction of a replacement hospital on the same site”. The government has previously committed $500,000 to Hamilton Health Sciences to facilitate the reworking of design documents which had already been submitted to the Ministry of Health. This work has already started. This rework was necessitated when a scaled-back version of the initial $280 million projected model was requested. In early February, the HHS received a document from the Ministry of Health outlining a $150 million build. For now, though, Oosterhoff is ecstatic. “This is a very good thing. We need to get estimates, cost estimates and scope of the project back to move further in the process. This is standard at this point,” said Oosterhoff, adding Premier Doug Ford is still fully behind the project. While Oosterhoff could not commit to any timeline, he was confident the build funding would not take another year to arrive.